PHILCON NEWS Page 5 THINGS FOR YOU TO DO 1. As mentioned in "The Philcon Policy", we plan to have a musical program at the affair. If you write music or play an instrument contact the Chairman about contributing to the musical program. 2. If you are an artist of any type, let us have something for the Art Exhibit. This includes painting, sculpturing, drawing, photography, etc. 3. If you have an interesting topic on which to speak, let us know, and we will put you on the program. If you know somebody who can speak interestingly on an interesting subject, let us know and we will twist his arm. 4. If you have any ideas at all, send them in. 5. Save your money — you might need it! Contact the Chairman concerning any contributions to the program at 2113 N. Franklin Street, Phila., Pa. PROGRAM ADS Like the sponsors of THE PACIFICON we believe in an interesting and attractive program — and not a skimpy-one either. 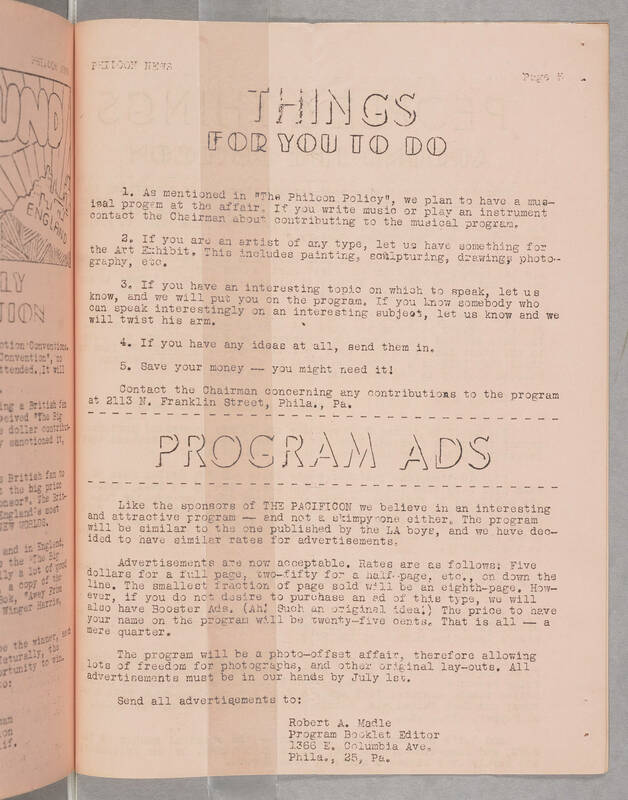 The program will be similar to the one published by the LA boys, and we have decided to have similar rates for advertisements. Advertisements are now acceptable. Rates are as follows: Five dollars for a full page, two-fifty for a half-page, etc., on down the line. The smallest fraction of page sold will be an eighth-page. How- ever, if you do not desire to purchase an ad of this type, we will also have Booster Ads, (Ah, Such an original idea!) The price to have your name on the program will be twenty-five cents. That is all — a mere quarter. The program will be a photo-offset affair, therefore allowing lots of freedom for photographs, and other original lay-outs. All advertisements must be in our hands by July 1st. Send all advertisements to: Robert A. Madle Program Booklet Editor 1366 E. Columbia Ave, Phila., 25, Pa.